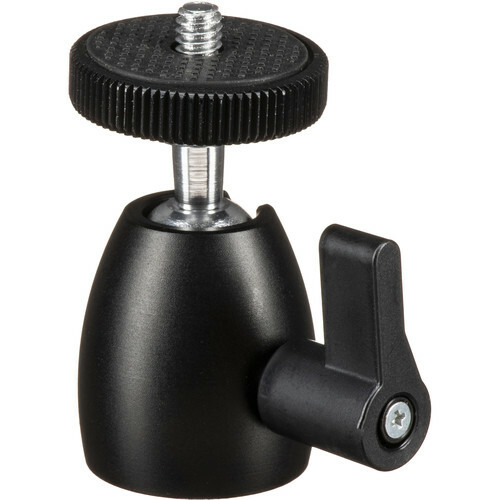 The Dot Line DL-0611 Medium Ball Head is an all-metal ball head for DSLR cameras. A standard 1/4"-20 bolt enables a camera to be mounted on the head, and a kip handle tightens and loosens the ball joint so you can precisely orient the camera: the head tilts up to 90° and the lower section rotates 360°. The ball head measures 2.25" high and its base is 1.25" in diameter. It supports typical DSLR setups weighing up to 3 lb. A female 1/4"-20 thread on its bottom enables mounting the ball head to a tripod. Box Dimensions (LxWxH) 3.6 x 3.0 x 2.1"
DL-0611 Medium Ball Head is rated 2.0 out of 5 by 2. Rated 3 out of 5 by Josh from Ok, but needs to be more heavy duty! I like the concept of this ball head, but it will not hold up my Panasonic GH2 very well. If I get another one, I will get a stronger/larger one. Rated 1 out of 5 by Todd from Terrible product I use this for mounting my GoPro to give it better maneuverability. Right out of the box I tried the locking handle and it broke completely. I could not even loosen the thumb screw to undo the tension on the ball joint. Thankfully B and H is awesome with returns. I suggest the Stroboframe version of this product as it is built much better.